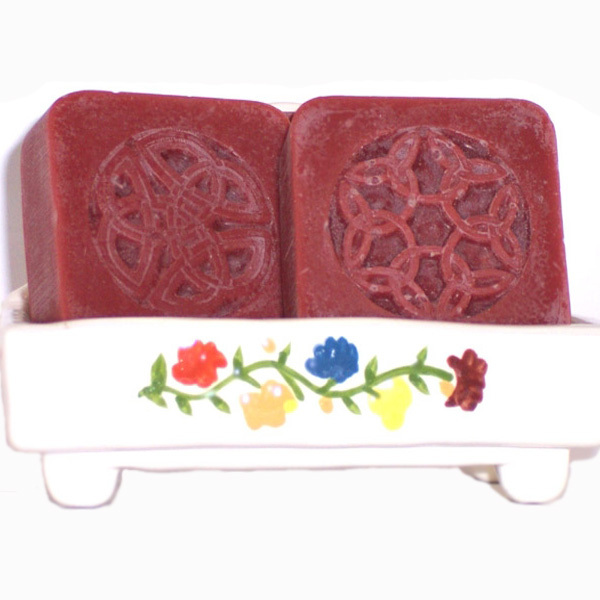 Celtic Cherry handmade soap has tangy, rich scent with the deep sweetness of luscious ripe black cherries. Creamy lather cleanses gently leaving skin silky. Celtic Cherry Artisan Handmade Soap has a hearty cherry scent that’s deep and rich with the sweetness of luscious ripe black cherries. This is not a candy scent; it’s more like a realistic cherry. The creamy lather gently cleanses, leaving skin silky. This luxury cherry soap is loaded with pure virgin olive oil, coconut oil, mango butter and castor. Invite this soap into your bath or shower for an aromatic experience. I superfat all my soap batches at least 7%. Superfatting means that some of the oils and butters stay in their natural form to make the soap mild and gentle. I cure my soaps for four to six weeks so the water used during the soapmaking process evaporates. This makes the soap harder and it will last longer in your shower or bath. To help keep your handmade soap as long as possible, keep it out of direct stream of water or standing water puddles so it doesn’t get soggy. It’s best to use a soap dish that drains and let it dry between uses due to natural glycerin. Cherry handmade soap comes with an ingredient label and is packaged in a organza gift bag. Help keep your skin hydrated and happy. Buy Celtic Cherry Handmade soap and see what silky skin can feel like.